Mortal Kombat 11 makes a positive first impression and the 2018 NDPs expose last year's underachievers. It's good to be back! The Winter Games Rundown 2019 warms our chilly hearts with the hopes and expectations of games we've been waiting years for. We've been collecting and rejecting community-submitted recruits for months, and now it's time for them to do battle. Imagine of version of D&D with the dumbest possible rules. Like delicious Christmas cookies, the November NPDs have freshly arrived for us. Also like Christmas cookies they're not too surprising. Also we play Rank the Significance for 2018! The Game Awards dropped a bunch of new game announcements and between Mortal Kombat 11, The Outer Worlds, and Marvel Ultimate Alliance 3, Kyle is struggling to get them all in one show. Epic Games decided to make its own game store because all the other platforms are charging developers too much money, and it seems cool? Sony's skipping E3 next year, and that can either mean they're chilling out for a full year or maybe E3 is too expensive to be worth it. It could also mean nothing, but we're going to talk about the PlayStation 5 anyway. Microsoft has acquired two new studios (one we already pretty sure about) and Square Enix continues to make the most baffling business moves. With Diablo Immortal, Deltarune, and Smash Bros Ultimate news, we learn even more about the ever-changing rules of games promotion. In the Halloween spirit, we call Trick or Treat on the strange list of PlayStation Classic games. The September NPDs are in and while we all expected Spider-Man to be on top, nobody could have predicted this level of unprecedented success. I mean Kyle kind of did. Game development crunch time is in the headlines again, so now seems like a fine time to pour out all of our feelings on the subject. In this week's episode, the panel convinces Kyle of the non-obvious values of streamable video game services. Blurry cellphone footage of an early trailer for a huge Harry Potter game has us giddy like Dobby on Buckbeak eating some Bertie Bott's over the Whomping Willow. Before we say goodbye to Telltale, we delve into the accomplished studio's entire catalog. Nintendo makes two small announcements for two big games, and the best-sellers list of August contains a couple of interesting anomalies. Sega and SNK headline Tokyo Game Show with two beautiful and surprisingly big budget game announcements. Before the fall season of gaming really takes off, we prepare ourselves with a Release Rundown of the super chunky next four months. Streets of Rage 4 and an Onimusha remaster headline another wonderful week of our shared existence inside of Michael Huber's dream. The panel is filled with Gamescom cheer as we unwrap a bunch of new game announcements and news. The art of the game reveal was on full display last week, as Smash Bros Ultimate, Red Dead Redemption II, and Doom Eternal each amazed audiences in their own unique styles. Evo isn't just the biggest fighting games tournament of the year, it has also become the best event to dump exciting fighting game announcements. Nintendo and PlayStation continue to report great numbers to their investors, but it's up to us to determine how great these numbers are (approximately, of course). Rumors of a second Xbox Scarlett dedicated to streaming are too reasonable to not believe, and we gotta cover Comic Con. The panel predicts the future world of twelve months from today, and it's actually mostly optimistic. Darksiders III announces its release date and we're still confused if this game is a big deal or not. Fortnite continues to be surprisingly newsworthy on top of increasingly popular, and the Desire Index faces more top ten shakeups. This month's NPD report brings us an unexpected victor, and we still have to fit Devil May Cry 5, Red Dead Redemption II and Sekiro into the EZA Desire Index. We've only begun covering the games that showed up at E3, and of course there is no better way to have a discussion than to arbitrarily rank titles. Kyle heroically does his best to encapsulate E3 2018 in a race against time and the panel's diminishing mental faculties. Fallout 76 and Assassin's Creed Odyssey drop their names before E3, and we look forward to the PlayStation and Nintendo press events with unmitigated anticipation. This year's big Pokémon game is a little--how do you say--simple. Also, we continue our E3 Press Conference preview with Bethesda, Square Enix and Ubisoft. The E3 preview officially begins with hopes and expectations for the EA and Microsoft press conferences. Thanos visits Fortnite, Nintendo's online service is just as bleh as you would expect, and Square Enix is back to E3 presentations this year. Shadow of the Tomb Raider had its big reveal and we're not exactly clamoring for Croft Editions, and Nintendo is getting a new President soon. Housemarque announces something that might be similar to a Battle Royale game, Valve buys Campo Santo, and the March NPDs are all good news. Rumors have bubbled up that Call of Duty: Black Ops 4 has axed its campaign in favor of a battle royale mode, and we're split on whether that's good or bad. Boss Key Productions quickly rebounds from LawBreakers with a new battle royale game, and Spyro's remastered trilogy inspires an exhaustive look at his entire gameography. From God of War to The Crew 2, the next three months have a great mix of huge releases and games you kinda forgot about. Also, Shadow of War makes a Good Guy move a little too late. E3 2018 is already promising some interesting changes, the Final Fantasy XV team is working on a new IP, and the Xbox Game Pass makes a little more sense after the launch of Sea of Thieves. Shadow of the Tomb Raider's teaser fails to leave an impact, the Switch has the best first year of any console in the US, and Vivendi finally gave up on buying Ubisoft. Special guest Ben Hanson of Game Informer joins us to discuss the low-detail announcements of Super Smash Bros., The Division 2, and Call of Duty: Black Ops 4. The ESRB has solved this whole loot box conundrum, America has really warmed up to Monster Hunter, and Square Enix thinks the mobile version of Chrono Trigger is OK for PC. The bosses of Sledgehammer Games are stepping down, and it turns out that's actually pretty interesting. Also, it's the 100th episode of this podcast! It's a rumor heavy week, with whispers of a remastered Spyro trilogy, Metroid Prime 4's developers, and Google getting into streaming games. Red Dead Redemption 2 is delayed and nobody seems to mind, Marvel vs Capcom Infinite is officially unpopular, and this year's Call of Duty is heavily rumored to be Black Ops 4. Will Microsoft buy EA? Probably not, but it's fun to talk about. Also, Anthem's release date is shifting forward to 2019 and Paragon shuts down in the best way possible. Microsoft will be giving out all their exclusive games for 10 dollars a month, Switch is the U.S.'s fastest selling console ever, and there are convincing new rumors of a Fable sequel. Nintendo's Mini Direct contained a couple mega announcements, Detective Pikachu loves coffee, and we play news producers with some upcoming remasters. This week we're pitting the games publishers against each other to determine who's about to have it better in 2018. In our 2018 Winter Forecast, we're looking forward at all of the coldest months' biggest releases, from Monster Hunter World to Sea of Thieves. It's the Year Review episode. We're taking 2017--all the great games, the disappointing games, and the games that never were--and giving it a final score. There's a third Catherine in the PS4 remaster, Square Enix reassures us that a new Tomb Raider is coming, and Bandai Namco is publishing some sweet anime games. The Game Awards and PSX have given us many new game announcements to discuss, like Bayonetta 3, Soul Calibur VI, Witchfire, and From Software's next project! Mega Man 11 is a real deal Mega Man game with a sorta modern twist, Mega Man's classic games are going to be on everything, and also a cereal box can be an amiibo too. Valkyria Chronicles 4 has been announced and it's impossibly true to the franchise's strengths, Mario and Assassin's Creed duke it out atop the October NPDs, and we have to talk about microtransactions every week. Fighting game cameos continue to surprise us, The Game Awards nominees have been announced, and we chomp into some juicy rumors. As studios sadly close and restrategize to accommodate the ever-evolving gaming landscape, we learn what fiduciary duty means. Sucker Punch reveals an incredibly interesting new title, and that's just one of many new Paris Games Week announcements to cover. Animal Crossing comes to phones and horrifies in innovative new ways, the Super Nintendo Classics connected with the marketplace, and the Xbox One can now play Xbox games. This week we're focusing a great deal of the show on covering EA's sad, strange, and scary decision to close Visceral games and overhaul Amy Hennig's Star Wars game. The Easy Allies Podcast fixes loot boxes in 15 minutes, God Eater 3 is announced without some crucial details, and Street Fighter V: Arcade Edition might be for the best. As October arrives, so must Part 2 of our fall preview. Assassin's Creed Origins, Super Mario Odyssey, and Wolfenstein II: The New Colossus come out on the same day. This stuff is just inconceivable. Epic Games makes their own Battle Royale and the PUBG devs don't like it, WayForward is making an actually-interesting game out of The Mummy remake, and Avalanche Studios kicks off the next gen countdown timer. Square Enix announces an a new mysterious survival shooter from an unexpected team, Monster Hunter World establishes itself as a real big deal, and modders discover a hidden NES game in the Switch's firmware. ThatGameCompany's next game is a big Apple exclusive, Rockstar puts extra effort into the re-release of L.A. Noire, and Okami HD is at least So Necessary. The No More Heroes semi-sequel, much like Nintendo, has a great deal of love for indie games, PlayerUnknown's Battlegrounds is officially a big fat monster hit, and Huber gets to talk about some red hot Resident Evil 7 announcements. Half-Life 2: Episode 3 concludes in an unlikely fashion, Sega has a lot of big plans for Yakuza, and and the Secret of Mana remake is just right for Damiani. Gamescom brings some big game announcements like BioMutant and Age of Empires IV along with some littler game-related news. Also, we get to play Locks, Sleepers, Keepers, and Busts for 2018. SWERY's new crowdfunding campaign is for an RPG where you become a cat, Kyle missed some big Japanese game announcements last week, and we should stop and talk about Sonic the Hedgehog. Valve announces a game we don't necessarily want but will definitely make money, former DICE head Patrick Bach sets up shop with Ubisoft, and AM2R's demise has a gloriously silver lining. The fall season kicks off in the middle of summer this year, so we're tallying up the surprisingly extensive list of big releases across August and September, while of course announcing our Pop Tarts and Toaster Strudels. Telltale keeps pumping out games and we somehow keep getting excited, Tekken 7 is the king of iron sales charts, and Evo turns out to be a good place for fighting game announcements. It's a Love & Respect only episode! We talk serious game stuff, play silly games, and stretch the limitations of our imaginations. Warframe might be a bigger deal than we ever give it credit for, the Switch gets the little brother treatment with WWE 2K18, and the Xbox One X is still new hardware coming out soon. Mass Effect Andromeda will not have any story DLC, Sony passes off Xbox One X footage of Anthem as their own, and Activision only needs two games. Star Fox 2 is resurrected from the depths of Nintendo's archives through the power of the SNES Classic, Sega has a much harder time capitalizing off its own back catalog, and we have a long talk about Crash Bandicoot. The IO Interactive/Hitman story actually has a happy conclusion, Modern Warfare Remastered gets its own separate release after all, and it's worth talking about what Injustice 2's success means. Far Cry 5 really is in modern-day Montana, Lost Sphear is the next product rolling off the conveyor belt of the Tokyo RPG Factory, and Bethesda and Ubisoft have some crucially imperative press conferences coming up. Mario + Rabbids is real and we have to accept that, Red Dead Redemption was delayed half a year, and, finally, the E3 Press Conference Previews begin! The Switch is not top priority for the next Lego game, Project Rap Rabbit might not have all the ingredients for a successful Kickstarter, and yes, it's obviously a cool, good thing that Phantom Dust is a free game. The next Assassin's Creed is digging into those origins we've all been curious about, Far Cry is almost definitely in Montana but probably not in the 19th century, and we peer forward into some future news. THQ Nordic proves that Darksiders is worth fighting for, the New 2DS XL rides the 3DS family out in style, and the Rabbids/Mario crossover continues to be real. 2017 may have had one of the best starts to a year we've ever seen, but how do the games that kicked off 2016 look today? A lot of groovin' and sleepin' going on. Bandai Namco strings out the announcement of their new IP, the Switch's software lineup slows down, and the NES Classic is already dead. Project Scorpio finally reveals the cold hard details (that we struggle to comprehend), Battlefront 2 easily impresses the easily impressed, and a pretty great Dragon Quest XI event comes with disappointments. Mass Effect: Andromeda promises to fix things, Persona 5 has very particular rules about spoiling anything, and it turns out the Destiny 2 reveal didn't reveal very much. Destiny 2 is real and definitely has some exclusive content, Call of Duty is going back to the past, and sometimes remasters are newsworthy. It's time for another All-Love & Respect special, featuring questions about the reactions to Mass Effect: Andromeda, the value of console power, and the greatest trailers of all time. Middle Earth: Shadow of War will be a big Project Scorpio showpiece, it's never too early to start talking about E3, and whoa whoa, Resident Evil Revelations is coming to Xbox One and PlayStation 4 in Fall of 2017. Breath of the Wild is one of the best-reviewed games of all time, the Nintendo Switch has a pretty darn successful launch, and sometimes it might be okay to let a console fade away. Middle Earth: Shadow of War seeks to expand the Nemesis System in every way possible, the Xbox Game Pass shakes up the biz, and Nintendo proves they love Nindies. As the Switch's launch draws near, we look at the legacy of the Wii U through the games that tell its gloomy, joyful story. Zelda's DLC proves that nothing is sacred, E3 becomes a expo for anyone with 250 bucks, and Evo innovates in selecting its 9th game for competition. The PlayStation 4 Pro activates Boost Mode, EA still believes in NBA Live, and the Games with Gold vs PlayStation Plus gets heated. Square Enix will be publishing new Marvel games (but at what cost?! ), smaller studios announce sequels we can get behind, and former Rockstar rock star Leslie Benzies is working on the next big everything. Fire Emblem finally gets some respect, Banner Saga 3 brings the franchise back to crowd funding, and the Cars 3 game is much more newsworthy than expected. The Nintendo Switch has finally been fully unveiled, and so we cover each new game announcement as well the big news from last week's presentation. Microsoft cancelled Scalebound this week, continuing an unattractive trend, but also we got to see a pretty sweet cancelled Mega Bloks Halo game so it's not all bad. The beginning months of 2017 prove to be a chunky meatball sandwich of legitimate game releases, and we're discussing them all. As the year comes to a close (a couple weeks early) it's time to reflect on how the world of gaming has changed in 2016. From Marvel vs Capcom Infinite to Uncharted: The Lost Legacy, PSX and The Game Awards have given us the gift of spicy, juicy game news. Against all odds, it really seems like Marvel vs Capcom 4 is happening (but not Wolverine), the most outlandish Switch rumors continue to seem real, and Nintendo teases slightly more of its theme park plans. Happy (US) Thanksgiving! Since Kyle's on vacation, we're doing a very special All Love & Respect episode! (This podcast was recorded on November 15th, 2016). On this week's episode, some hot new Switch rumors help tide us over until its March release, the Xbox One S can't stop winning in North America, and Telltale's Marvel game is most likely Guardians of the Galaxy. Mass Effect Andromeda doesn't quite kerplunk yet doesn't quite impress, and PS4 Pro and the NES Classic Edition both launch this week. Shadow of the Tomb Raider leaks on a train, some unfortunate news is dutifully covered, and the extremely popular Games with Gold vs. PlayStation Plus segment heats up! There's still so much to say about Switch, Bethesda thinks their games don't need early reviews, and the SAG-AFTRA strike is serious business. On this week's episode, we cover the official announcement of Red Dead Redemption 2, but stop short of speculating about it since we haven't seen the official trailer yet. A new Power Rangers game doesn't look that new, whales are playing games before everyone else, and the PlayStation VR's release is just about here. Amazon reveals their big budget games of varying significance, Battleborn will become something close to free to play, and we do a new dumb game. Destiny 2 leaks suggest the series might be taking some exciting risks, Beyond Good & Evil 2 seems to be totally happening, and Sonic Boom: Fire & Ice still got bad reviews. Before video games awards season kicks off, we put our chips down on the GOTY So Far, while doing our best to remember those games that will not come close. Nintendo and Apple become closer friends than expected, Sony announces new games at TGS of varying significance, and of course we gotta talk about the PlayStation 4 Pro. Before the mudslide of fall releases begins, we check in on the panel's thoughts and hopes for each big release. Nintendo's 3DS announcements are not the news we were hoping for, PlayStation Now streams to PCs, and Gran Turismo Sport respects the franchise's tradition. Dark Souls III DLC gets the team fired up, Metal Gear Survive sounds like something Brandon might try, and the slim PlayStation 4 isn't juicy enough for Ian. Call of Duty Zombies continues to amaze Kyle (and no one else), Final Fantasy XV gets a final delay, and we discuss THQ more than we maybe ever have. Sony announces their Neo announcement, No Man's Sky pushes the boundaries of review embargoes, and Nintendo shuts down a beloved fan project. The Xbox One S is a secret mini beefcake, Disney Infinity continues to break Jones' heart, and Ben quit Hearthstone! Rumors indicate the NX is in fact a strange handheld hybrid, Sega announces two new Sonic games, and then finally some stuff happens that Brandon is interested in. Nintendo unveils a little holiday money-maker, Evo continues to grow, and the panel plays devil's advocate. Nintendo finally conquers mobile with its savvy work on Pokémon Go, E3 2014's Best of Show goes free to play, and Warner Bros. gets their wrists slapped for paying off the significant media. The world around CSGO becomes a swamp of questionable morality, and the Game Critics Awards for E3 bring out the debut of Yup or Nope. When a wild Miyamoto interview sparks even more confusing speculation, we take it upon ourselves to plan the NX announcement. E3 flew by last week and we never stopped to remark on all of Microsoft's big news. Quick, now's our chance! This week's podcast was recorded live after the first day of E3, and it definitely feels like it. The highly-engaged panel covers the five (or so) biggest game announcements and a brief rundown of each press conference. It's the week before E3, so we're spending an extra-long episode cramming in as much as we can before the big show begins. First we have to chew through the rumors of a beefed-up Xbox One, but then we continue our extended look into what to expect from E3's big press conferences. We officially begin our E3 countdown with an exhaustive outpouring of our hopes and realistic expectations for the EA and Bethesda press conferences. Dragon Ball is still a headliner, box art never dies, and we were wrong about Doom. Also Damiani is back. Battlefield 1 gets all gritty and nasty, the new Pokémon doesn't seem that new, and EA triples down on Star Wars. Call of Duty really is going to space, we finally sift through last week's waste bin of Nintendo news, and Huber will not apologize for going media blackout. 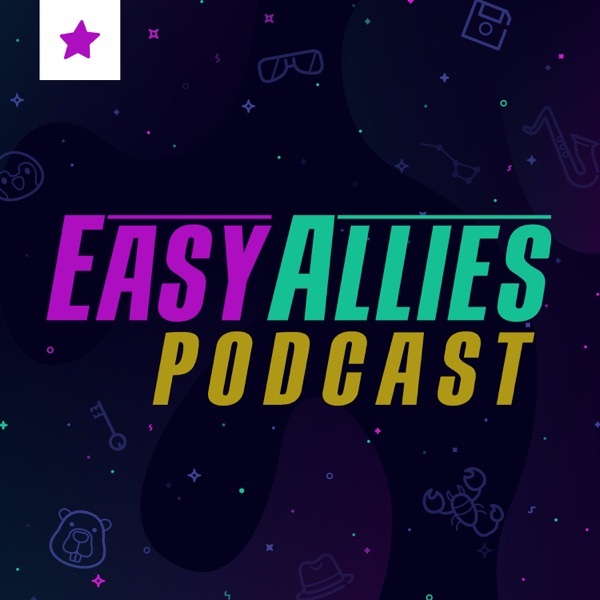 This week the Easy Allies panel discusses each of the big games coming out between now and E3, and somehow forgets to bring up Nintendo. Supergiant's new game is a bigger deal than Insomniac's new game, Giant Bomb reports some very detailed PS4K specs, and GameStop seems serious about making games. Titanfall 2 whispers its name before E3, Rockstar North's former president wants some money, and a Fear Effect Kickstarter is happening at last. We all get a sneaky sneak peek at God of War 4, the PS4K is shaping up to be a mean machine, and Final Fantasy XV has already made an impact. The annual COD rumors are slightly more exciting this year, nobody wants an NX controller with no buttons, and Dark Souls III already opened Pandora's Box. The first episode of our Podcast is here! Kyle Bosman and the boys are ready to talk games. With your help we'll make each episode better and better.